1. Please list all of your strong points as a tennis player. What are your best shots, are you mentally tough, etc? 2. List all of your weak points as a tennis player? 3. Have you ever had days where you did much better on your "so called," weak points or strokes? Ex) if you feel you have a weak backhand but one particular day you hit it extremely well. 4. Do you tend to focus your attention on your weak points? Whatever you focus upon magnifies. So if you keep telling yourself you have a bad backhand it will only get worse. 5. What level of play would you have to achieve to beat your arch rival tennis opponent? 6. Do you believe you have the potential to be a great tennis player? If not what is holding you back? 7. Do you lack talent or are you just not using your intelligence correctly? 8. What one shot if you improved it would help you tennis game the most? 9. Please rate yourself from 1 to 10 on these Critical Success Factors of Tennis with 1 being the lowest score and 10 being perfect. Mastering these factors are crucial to peak performance in tennis. If you have any particularly low area you must focus your attention on that area so that you don't have any week links. 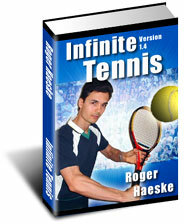 If you could truly say you were a 10 in each area you would be a great professional tennis player. 10. Have you focused on improving your strengths? Sometimes a strength is not fully developed because you spend all your time trying to improve your weaknesses.